Why should I buy from EvinceMage? EvinceMage provides you the best source for latest Magento extensions and integrated services, something that secures and adds awesomeness to your business module. What kind of migration services do EvinceMage provide? 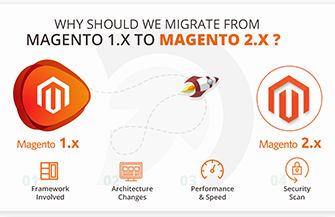 EvinceMage provides you two kind of migration services; Server Migration Services and Magento Migration Services. What kind of SSL Setup service do EvinceMage provide? EvinceMage offers SSL setup in two ways; SSL via Cpanel and SSL via SSH +100 that will make your site movement secure. What if there is any problem with the extensions or services? EvinceMage provides you the latest Magento extensions which are developed and tested by certified Magento developer, if in case you are facing any bug with the extensions then you can report the same on support@evincemage.com, same goes with the services too. What should I do after purchasing your installation service? Once we receive your Installation Service Order, you will receive a confirmation call from our executive for the required information or else you can directly email us your details regarding FTP Account, SSH and Admin Access of your Magento Site. As soon as any of these processes is done, the installation procedure will begin the very next moment. How can I get the products after purchasing? When your order is completed successfully, you will receive an email on your provided email address that will help you to get the complete guideline about your product and process of getting it. You can even directly log-in on https://evincemage.com with your registered email address and then go to “My Account” where you can find “My Downloadable Products” to download it directly from the purchased items. How can I purchase Extension? EvinceMage is an easy and clean platform where you can purchase latest & secure Magento extensions just on a click, to purchase an extension you just need to add your required extension to the cart and then choose a payment option and there you go. To download your product, go to “MY Account” – “My Downloadable Products”. Why can’t I add products to cart successfully? Can I request refund for the installation service? We always assure your purchase for our installation service and we will complete the installation process (including the oscillation of errors) successfully. The amount you are paying for service is charged on the basis of time spend for installation. Unfortunately, refund will not be considered.